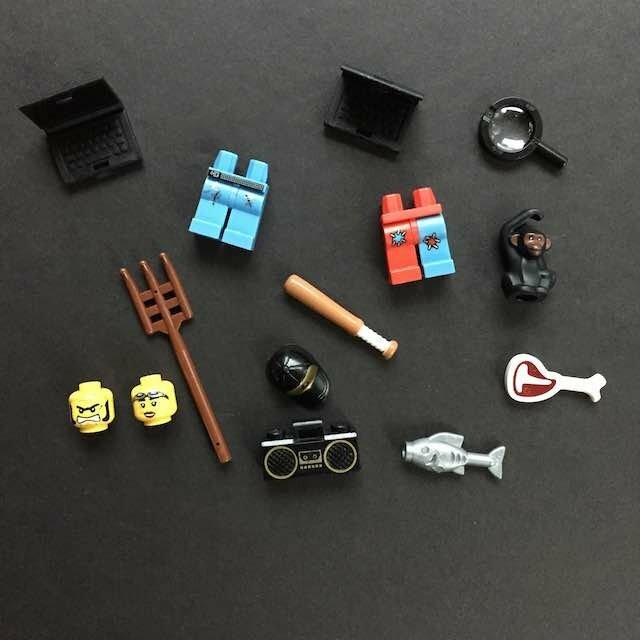 I was unsuccessful finding another thread which covered the same topic, so starting up a new one to communicate new elements found in Build-a-Minifig Bars at LEGO Stores. This past weekend I found seagulls and cats at the Indianapolis store. Excellent way to build up a flock or a clowder. I believe the cat is the same one found in Pet Shop (#10218) and Winter Village Market (#10235). 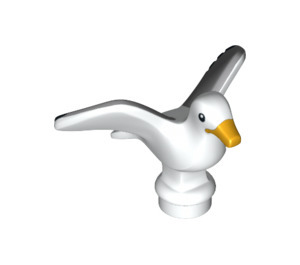 The seagull, as far as I know, only came in the Sea Captain set in Series 10 CMFs. Also found breastplate armor, which I don't recall ever seeing in the BaM before. But I'm not usually looking, unless there is a free/discount fig offer like there was this month. I believe it was the pattern from the King's Knight in King's Castle (#70404). Anyone else found new items of interest - especially those which are rare/uncommon? 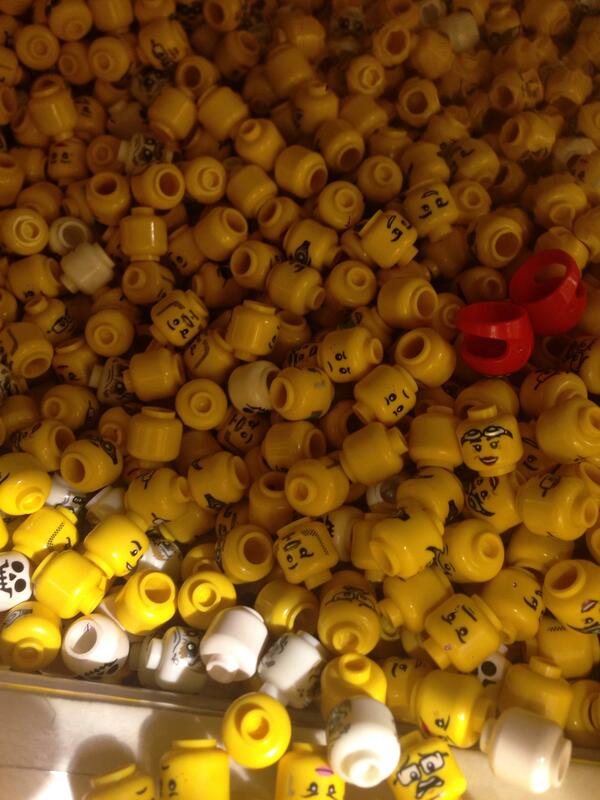 At the beginning of this month I found queasy guy heads in the Pleasanton, CA store. Managed to get a couple with my March coupons. Actually have seen Ghost shrouds at Build a Fig, but usually they are long gone by the time I get there. @sidersdd So glad you posted this! 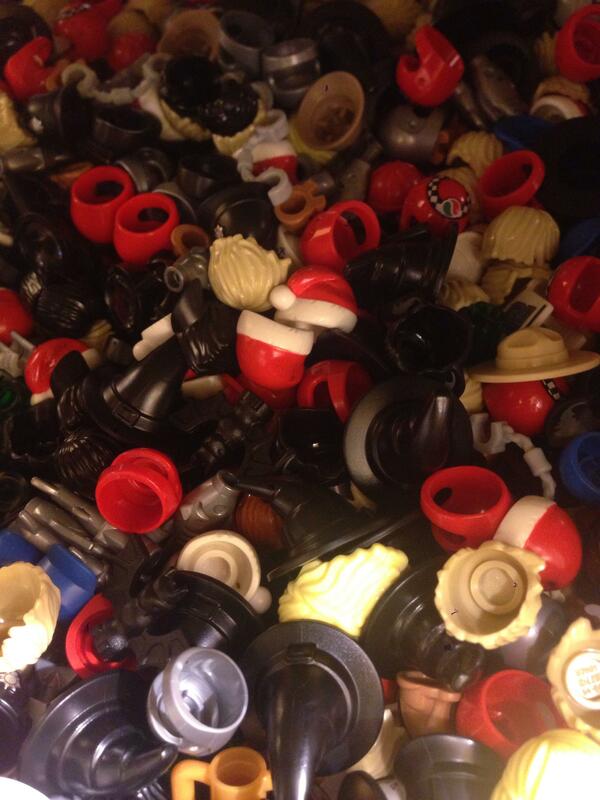 I picked up my free minifig over the weekend and was wondering how often the selection changes/turns over. Anyone know? 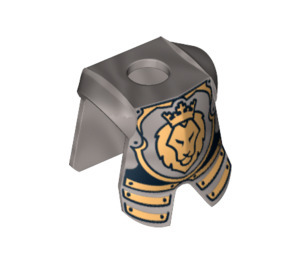 I got the breastplate -- it's the one from the CMF Series 9 Heroic Knight minifig 71000-4. I wish I lived near a store. I always hit up the BAM at least a few times over whenever I am able to visit. But they rarely have good stuff like that when I go. You can always ask the employees what BaM stock they have, sometimes they have stuff in the back. Went back tonight to use the last of my coupons. Saw a few more new goodies. Or at least they were new to me. I found the blue plumber's hat from the plumber CMF and the sick face from mixer. I have not seen those other parts though (the tile seems very interesting to me to be seen in a BAM). Edit: this was at the Oakridge mall store, Vancouver BC, Canada. When it comes to seagulls and cats and such- how many of those can you actually purchase? 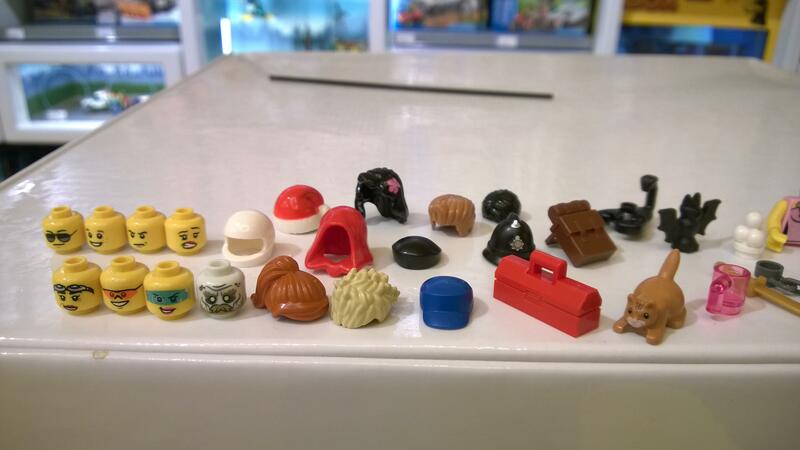 One time my daughter was able to substitute an additional hairpiece in place of the accessory for each minifigure. It may be worth asking to see if you can sub the hairpiece for an additional seagull. I was able to add an extra hairpiece per fig once rather than another accessory. I think they don't mind as long as you don't abuse it. 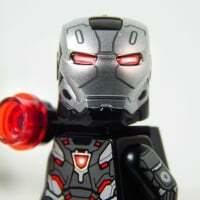 I saw the parts listed above, along with the Series 4 Viking torso. Valley Fair had the seagulls, brown muskets, "Gretel" hair, the breastplate you mentioned, police torsos, pirate hats (gold skull)... that's all I can remember from my visit yesterday. Ok... coupon? 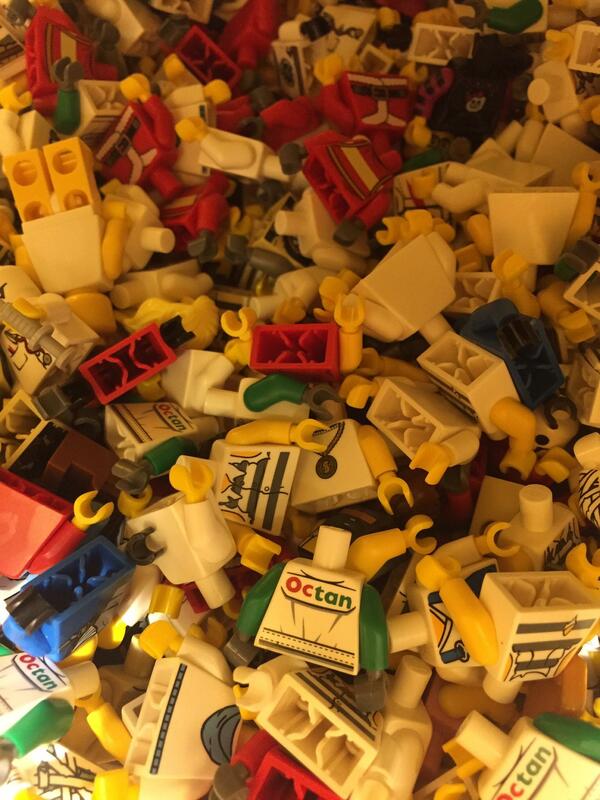 Free minifig? Where and how? Coupons were on the LEGO calendars that were provided at LEGO stores for X purchase or more. Then they were also on the website earlier this year, but long gone now and the offer is over as it is April and the figure coupons were good for March only with purchase (though some stores may still honor them). 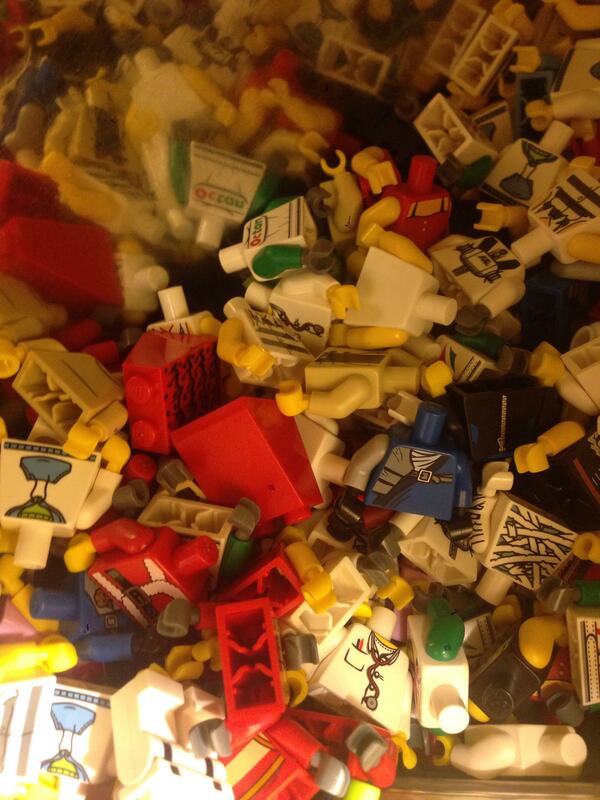 I've seen quite a few CMF parts show up at the BAM bar. 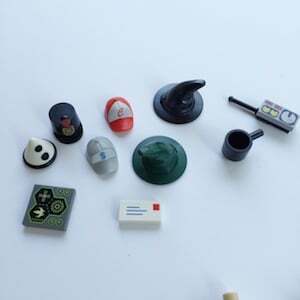 In addition to the ones mentioned already, I've gotten surfboards from the S2 Surfer, boomboxes from the S3 Rapper, hair/headphone from the S8 DJ, spiky hair from the S6 Sleepyhead, and just before Christmas there were Santa hats as well. 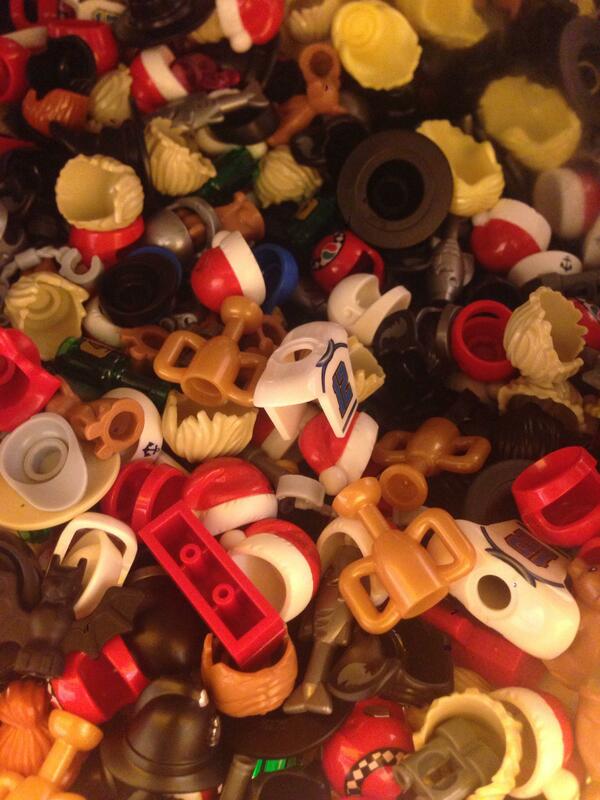 Most prevalent CMF hats I've seen were S12 game guy, S10 sad clown, and S13 paleontologist. The pirate hats I saw earlier were those from S8 pirate captain. All of the stores I've been to said you can put what ever you want in there as long as it is 15 pieces. I'd normally stock up on heads or rare torsos instead of full figures that I don't care about. I did find capes in there once and the employee said I could add another accessory. Another store said it counted as an accessory, so it really depends on where you go. I was at Downtown Disney store yesterday. Found some of the sick face heads from the mixer, some bumblebee girl heads, a few of the magician wands, a surf board from S2 (I bought the only one I could find), Skier pants from S2, Pop star pants from S2. Fitness instructor torso S5. Found a guitar from Santa's workshop. Spent a crazy amount of time at the BaM bar this morning, but came away with some decent finds, I think. The accessory bins were filled with tools -- crescent wrenches, shovels, etc. but if you dig down you might find something good. The letter and the thing that looks like a pan were down deep. I figure the legs for these torsos will turn up eventually, or I'll pick them up on ebay. 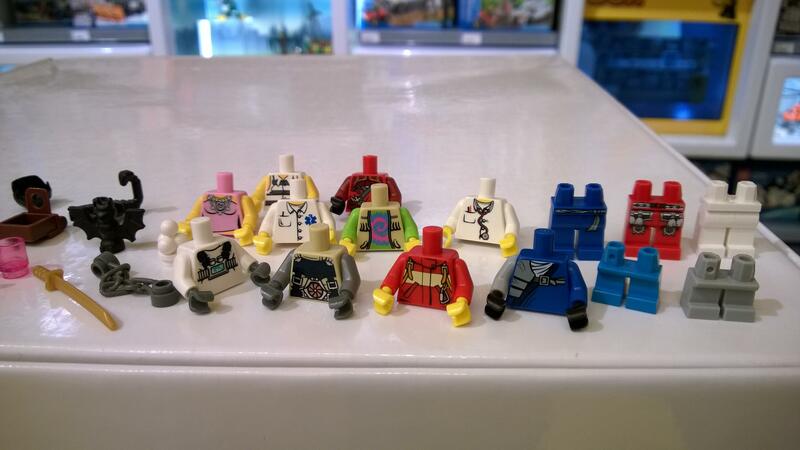 what store was it at i want the first torso. 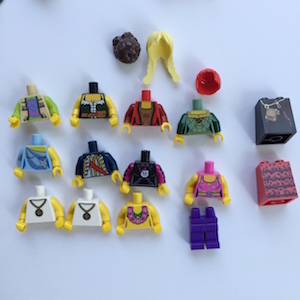 Isn't that the torso from the hippie CMF? And yep, it's the hippie. if I saw those in their I would get one jut cats and seagulls. 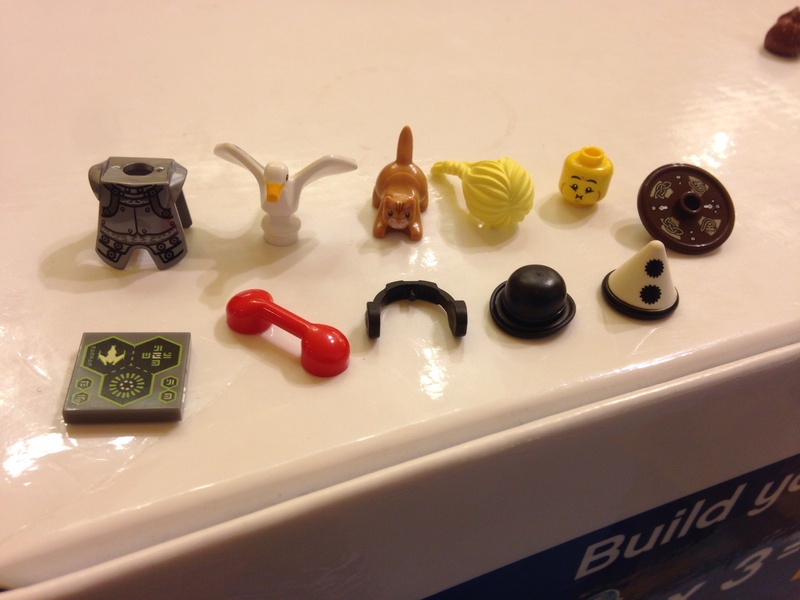 I believe in the letter of the rules with the BaM and just build figures with cats and gulls as accessories to the figures, plus it never hurts to have female figure parts (like hair of heads) or also the Minifig legs with the blue jeans outline on them. Rockefeller Center store had a lot of the same stuff already posted in the last couple of months, but there were a few "new" bits and bobs at the Flatiron NYC BaM Bar. They seem pretty common and undoubtedly cheaper on Bricklink if you want a bunch of pizzas, but hey. They also had what I think is a princess torso from one of the Castle sets. White w/ red corset type deal. At Valley Fair, I spotted a few cats, seagulls, and santa hats. 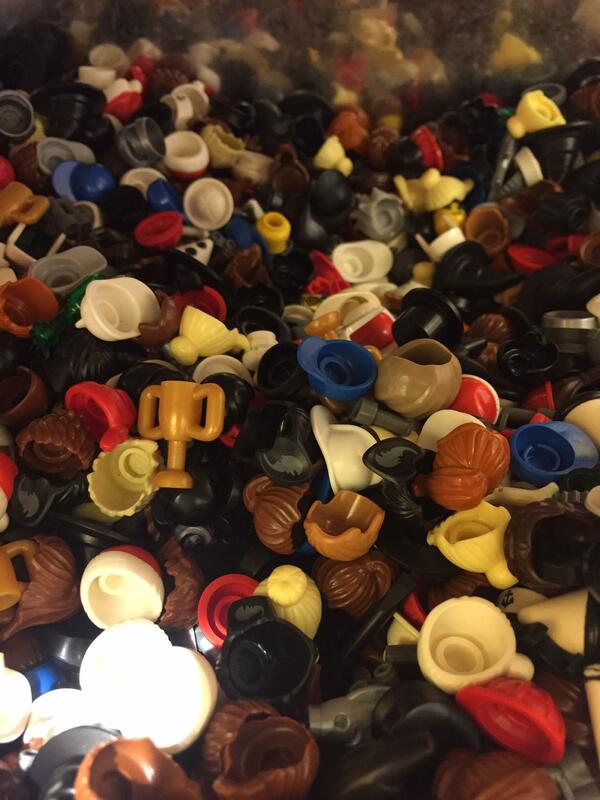 What minifig is that head from in the first row, far right? I don't recognize it. That's a ghost from Lord of the Rings. Interesting. They have agents, ninjago, and lotr in the bam...I've never seen anything like that before. I always interpreted BaM with any Chinese made parts (hence the CMF being found in them). I can see Ninjago and Agents as they are more sub themes than licensed, but you also have to wonder if LEGO stores are dumping set pieces into the BaM. I do not think they are allowed to do that, but you never know. I would imagine parts from licensed sets making a BaM would not appear, but LEGO has surprised me before. I hope my store updated as well. I'm tired of seeing nothing but police torsos generic faces. Awesome finds. @sidersdd Interesting that the top of the BaM is lacking a baseplate. Or at least I think there should be one. I've never seen a baseplate on top of them at any of the stores I've been to. 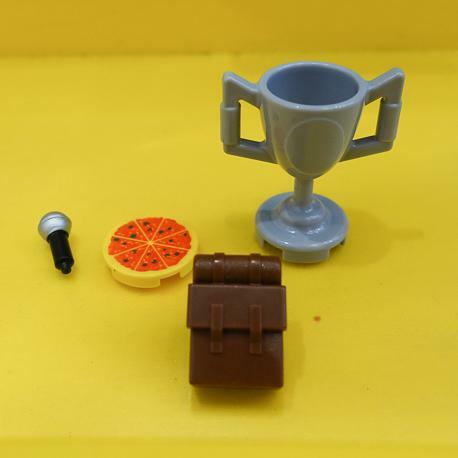 Interesting..
Hey, was just at the LEGO store I frequent and the now have the CMF waiter's wine bottle in the accessories now. Oklahoma City Lego store BAM bar... B The wine bottles and the bat boy helmet helmet were my favorites, didn't see any cats, but I did find lots of chihuahuas! Wow. Lots of CMF leftovers. Kinda sad. Wanted to see some minifigs from boxed sets. Fairly certain most BaM parts are from CMFs nowdays. While there may be a few basic set type guys I'm guessing we will see more Chinese figure parts and accessories in these bins. Some odds and ends at the BAM bar today. Not really a huge value, except maybe the t-bone steak. I needed the pitchfork to complete a scarecrow CMF, and the laptops are just so cute. 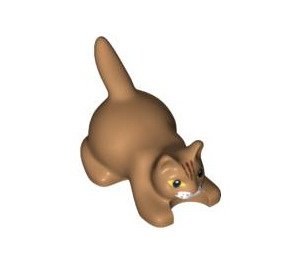 I should probably just dive in to bricklink. 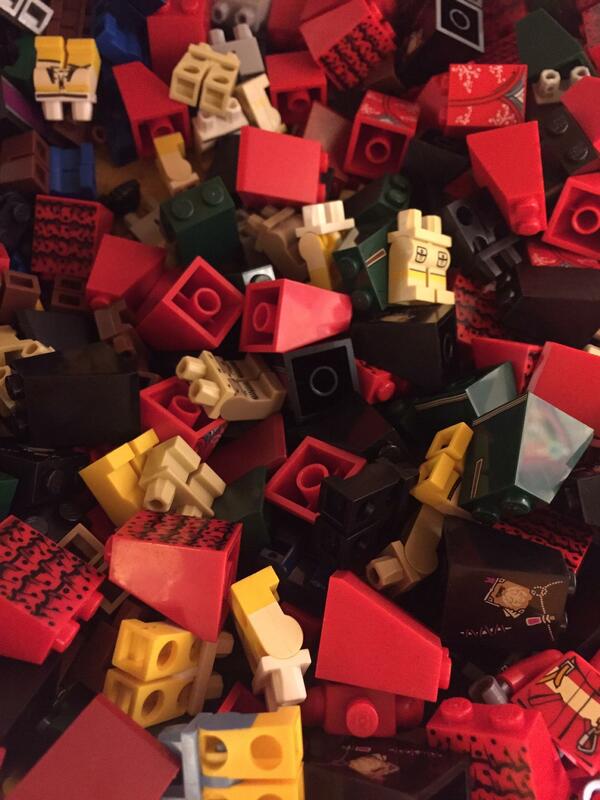 i wish I could just load them up in a PAB Jar. great for Lunar New Year...year of the monkey!